Received: June 5, 2018; Revised: June 21, 2018; Accepted: June 28, 2018; Published online: December 17, 2018. Although allogeneic hematopoietic cell transplantation (HCT) is the only curative treatment option for myelodysplastic syndrome (MDS), a substantial number of patients experience relapse. We reviewed the clinical outcomes of patients with MDS who relapsed after allogeneic HCT. 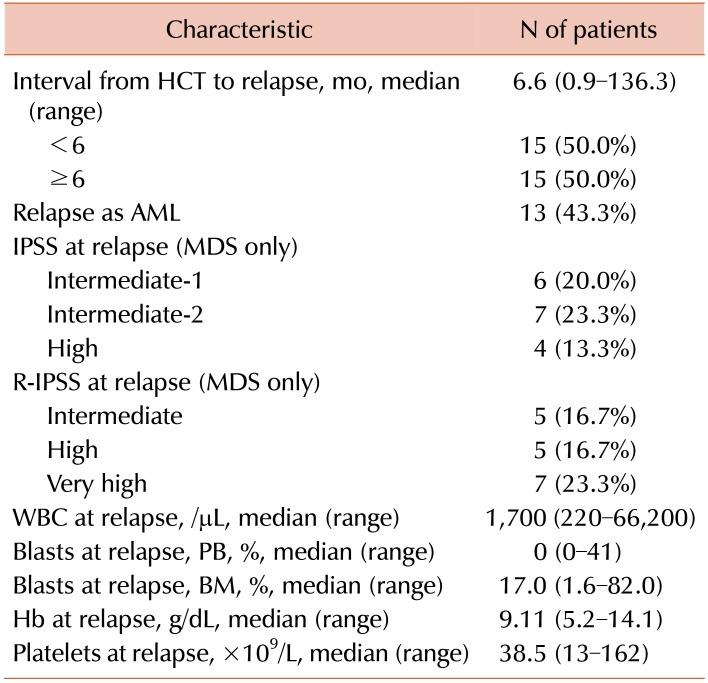 Thirty patients who experienced relapse or progression after allogeneic HCT for MDS between July 2000 and May 2016 were included in this retrospective analysis. The median time from HCT to relapse was 6.6 (range, 0.9–136.3) months. Donor lymphocyte infusions (DLIs) were administered to four patients: one achieved complete remission (CR) and survived disease free, while three did not respond to DLI and died. Hypomethylating agents were administered to seven patients: one who had stable disease continuously received decitabine, while six died without response to treatment. Six patients received AML-like intensive chemotherapy, and three achieved CR: two underwent second HCT and one DLI. One patient receiving second HCT survived without disease, but the other two relapsed and died. Three, four, and eight patients who did not respond to intensive chemotherapy, low-dose cytarabine, and best supportive care, respectively, died. One patient who underwent second HCT following cytogenetic relapse survived disease free. Median overall survival after relapse was 4.4 months, and relapse within 6 months after HCT was associated with shorter survival. Outcomes of MDS patients relapsing after allogeneic HCT were disappointing. Some patients could be saved using DLI or second HCT. Myelodysplastic syndrome (MDS) is a clonal hematopoietic disorder characterized by ineffective hematopoiesis, peripheral cytopenia, and potential evolution to acute myeloid leukemia (AML). Although there have been attempts to improve the outcomes of patients with MDS using hypomethylating agents (HMAs), lenalidomide, and other novel agents, allogeneic hematopoietic cell transplantation (HCT) is considered to be the only curative treatment option. In general, allogeneic HCT is offered to patients expected to be at a high risk of progression to AML and having shorter survival or those who have severe complications or heavy transfusion burden due to disease-related cytopenias. The long-term survival rate following allogeneic HCT is reported to be 30–50%. Approximately 25–40% of patients experience disease relapse after HCT, and outcomes of the relapsed patients are generally poor . Although salvage treatment strategies, including HMA, donor lymphocyte infusion (DLI), and second HCT have been attempted, there is no available standard of care for MDS patients who experience relapse after allogeneic HCT . Medical records of MDS patients who relapsed after HCT were reviewed to identify the clinical courses and treatment outcomes following relapse and to investigate the optimal therapy for these patients. Of 193 patients who underwent 196 allogeneic HCTs for MDS between 2000 and 2016, 30 experienced relapse or progression to AML after HCT and were included in this retrospective analysis. MDS relapse was defined as re-emergence or appearance of ≥5% blasts in the bone marrow (BM) or major myelodysplastic features such as cytopenia and transfusion dependence, based on the 2006 MDS response criteria of the International Working Group (IWG) . Progression to AML was defined as the presence of ≥20% blasts in the BM or peripheral blood. In patients who received treatment for MDS before HCT, the response was assessed on the basis of the 2006 IWG response criteria. The study protocol was approved by the Institutional Review Board of the Asan Medical Center in accordance with the 2008 Declaration of Helsinki. Overall survival (OS) was calculated from the date of relapse after HCT to the date of the last follow-up or death from any cause. The Kaplan-Meier method and log-rank test were used to calculate and compare the survival rates in univariate analysis, respectively. Multivariate analysis was performed using a Cox proportional hazards regression model. The SPSS version 21 (IBM Corporation, Somers, NY, USA) and GraphPad Prism version 5.01 (GraphPad Software Inc., La Jolla, CA, USA) were used for statistical analysis and to generate the graphs, respectively. Table 1 summarizes the disease and transplantation-related characteristics. The median age of the patients at the time of HCT was 54 (range, 19–70) years. A total of 23 (76.7%) patients received MDS-directed treatment before HCT: 20 were treated with HMA, 2 with intensive AML-like chemotherapy, and 1 with low-dose cytarabine. Of the 20 patients who received hypomethylating therapy, 5 showed marrow complete remission (CR), 13 had stable disease, 1 showed disease progression, and 1 could not be assessed. Of the two patients treated with intensive chemotherapy, one achieved CR and the other achieved partial remission (PR). One patient treated with low-dose cytarabine showed progressive disease. Seven (23.3%) patients received upfront HCT. Scores in the International Prognostic Scoring System (IPSS) and revised IPSS (R-IPSS) were recalculated at the time of HCT: 15 (50.0%) patients had intermediate-2 or high risk scores on the IPSS and 21 (70.0%) had high or very high risk scores on the R-IPSS. Six (20.0%) patients received hematopoietic graft from matched related donors, 11 (36.7%) from matched unrelated donors, and 13 (43.3%) from haploidentical familial donors. After HCT, 20 patients achieved CR with a complete cytogenetic response, 5 showed morphologic CR with persistent cytogenetic abnormalities, and 5 had progressive diseases. Patients experienced disease relapse or progression after a median time of 6.6 (range, 0.9–136.3) months, and 13 (43.3%) patients relapsed with AML. 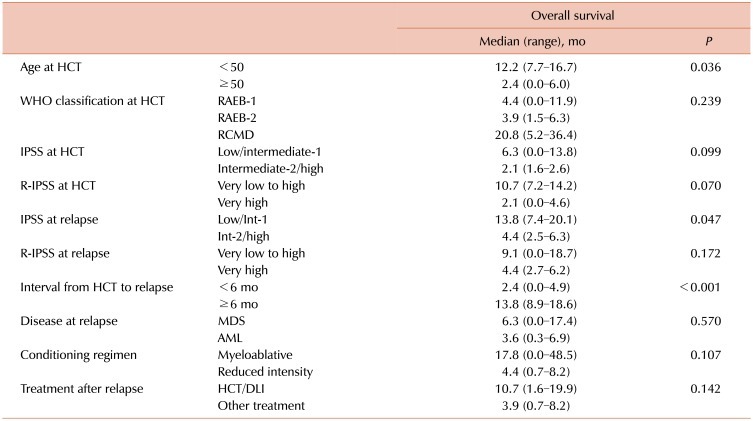 Table 2 shows the relapse characteristics of the patients. Fig. 1 shows the treatment modalities administered to relapsed patients and clinical outcomes. For the initial salvage treatment of relapse, 4 patients received DLI; 7, HMAs; 10, chemotherapy; 1, second HCT; and 8, best supportive care (BSC). One of the four patients receiving DLI infusions achieved CR. The responsive patient had received HCT for refractory anemia with excess blasts (RAEB)-1 from a matched related donor using myeloablative conditioning (MAC) and relapsed as refractory cytopenia with multilineage dysplasia (RCMD) 7.5 years after HCT. The patient survived in CR 49.2 months after a dose-escalated DLI (total CD3+ T-cell dose of 1.6×108/kg). The other three patients who received DLIs for MDS relapse, which occurred at 1.7, 2.1, and 3.4 years after HCT, respectively, showed persistent mixed chimerism and eventually died of disease. In seven patients with relapse after HCT, no response was observed after treatment with HMAs. One patient who had stable disease received five courses of decitabine at the time of analysis for MDS relapse, which occurred 11.4 years after HCT for RAEB-2. Three patients died of persistent disease and infection during treatment with HMAs for relapses, which occurred 6 months, 2.2 years, and 7.5 years after HCT, respectively. Three patients experienced progression to AML after 3–4 courses of decitabine treatment for MDS relapses after HCT. They received the second HCT; however, all died of the disease and/or bleeding complications. Six patients who relapsed with AML were treated with intensive induction chemotherapy, and three achieved CR. One CR patient, who received HCT from an unrelated donor using reduced-intensity conditioning (RIC) and relapsed 5.5 years after HCT, received the second HCT from a haploidentical familial donor and was alive without disease 4.2 months thereafter. The other two CR patients received the second HCT and DLI as post-remission consolidation therapy, but eventually relapsed and died. Three patients, who did not respond to intensive chemotherapy, died of disease. Low-dose cytarabine did not induce disease remission in four patients who died of progressive disease. One patient, who received HCT for RAEB-2 from an unrelated donor using MAC and experienced cytopenia with cytogenetic relapse harboring del(17q) 2 years after the first HCT, received the second HCT from an unrelated donor using RIC, and the patient was alive and disease free 4.7 months after the second HCT. Eight patients, who received BSC only, died at a median time of 0.7 (range, 0.1–12.2) months after relapse. The median OS after relapse of all 30 patients was 4.4 months [95% confidence interval (CI), 0.7–8.2] (Fig. 2). In the univariate analysis of OS, age <50 years (P=0.036), lower IPSS scores at relapse (P=0.047), and relapse ≥6 months after HCT (P<0.001) were associated with longer OS (Table 3). With regard to treatment options after relapse, the patients were categorized into two groups, HCT/DLI vs. other treatment, because only one patient received the second HCT. Univariate analysis showed a non-significant improvement in the OS of the HCT/DLI group compared with that of the other treatment group (median OS, 10.7 vs. 3.9 mo, P=0.142). Of the three prognostic factors for OS, relapse ≥6 months after HCT remained significant for OS [hazard ratio (HR), 0.195; 95% CI, 0.070–0.547; P=0.002] as shown in the multivariate Cox proportional hazards model (Table 4). In this study, the clinical courses of the patients who relapsed after allogeneic HCT for MDS were reviewed. Of the 30 patients included in this study, a median OS was 4.4 months, and only four survived (three in CR and one with disease). The poor outcomes reported in this study are similar to the previous retrospective study results from a French group, which showed a 2-year OS of 16% among 147 patients relapsing after allogeneic HCT for MDS . In a retrospective analysis of 108 patients who relapsed after allogeneic HCT for AML or high-risk MDS, the median OS after relapse was 130 days ; in a prospective study of azacitidine and DLI as the first salvage therapy for 30 patients relapsing after allogeneic HCT for AML or MDS, the median OS was 117 days . The time interval between HCT and relapse was considered to be an important prognostic factor for survival after relapse . The French group's study showed that relapse within 6 months after HCT (HR, 2.69; 95% CI, 0.82–3.98; P<0.001) and progression to AML at relapse (HR, 2.59; 95% CI, 1.75–3.83; P<0.001) were associated with poor survival outcomes in patients relapsing after HCT for MDS . The Spanish group's study found that the time interval between the first and second HCT and disease status at the second HCT were significant factors for survival . Sauer et al. analyzed the treatment outcomes of 108 patients who relapsed after allogeneic HCT for AML or MDS. Results showed that the time interval from allogeneic HCT to relapse was the only independent predictor for response to salvage therapy and OS. Our study also showed poor outcomes in patients with relapse within 6 months after HCT and confirmed early relapse as a dismal prognostic factor. The treatment of patients relapsing after allogeneic HCT for MDS is challenging, and various treatment strategies have been attempted. In this study, there were three disease- free survivors: one who underwent the second HCT for cytogenetic relapse, one who received the second HCT after achieving CR with intensive chemotherapy, and one who received DLI for low disease burden. DLI is one of the most commonly used interventions for the management of relapse after HCT. The Adult AML Working Group of the Japan Society for Hematopoietic Cell Transplantation reviewed 143 AML patients receiving DLI for hematological relapse after HCT, and the 5-year OS was 7% . Eleven (8%) patients in the study received DLI after achieving CR, and long-term survival was observed almost exclusively in patients who achieved CR before DLI. Outcomes of DLI with or without chemotherapy for AML or MDS relapse after T-cell-depleted RIC HCT were investigated in 51 patients, and the 5-year OS was significantly different according to the time interval between DLI and HCT (within 6 mo vs. >6 mo, 11% vs. 51%, P=0.008) and CR achievement before DLI (persistent vs. CR, 24% vs. 53%, P<0.01) . The abovementioned two studies regarding DLI as treatment for AML or MDS relapse after HCT showed that the effects of DLI were limited to the patients with low tumor burden; thus, early detection of disease relapse may be the key factor for long-term survival. In a prospective study, the combination of azacitidine and DLI as treatment for the 30 patients who relapsed after HCT for AML or MDS induced CR in seven (23%) patients and PR in two (7%), and five patients remained in CR . The second HCT has been attempted for the treatment of AML or MDS relapse. The Spanish group published the outcomes of 116 patients who underwent the second allogeneic HCT as treatment for relapsed myeloid malignancies (AML, MDS, and myeloproliferative neoplasm), and the 5-year OS was 32% . Oran et al. reported the outcomes of AML and MDS patients who relapsed after allogeneic HCT using RIC and were treated at MD Anderson Cancer Center. The results showed that a number of patients who underwent the second HCT as the initial salvage or consolidation therapy achieved long-term survival compared with those receiving other salvage treatments or supportive care (median OS of 25.3 vs. 2.4 vs. 1.6 mo, P=0.0001). In the French group's study, patients receiving DLI or second HCT showed significantly longer survival than those treated with other salvage treatments or BSC ; in another study, the response to salvage therapy was significantly improved in patients treated with a combination of chemotherapy and allogeneic cell-based therapy compared with those treated with chemotherapy alone . Preemptive administration of azacitidine was attempted in 20 patients with imminent relapse (CD34+ donor chimerism <80%) after HCT for AML or MDS, and 16 (80%) patients responded with either increasing CD34+ donor chimerism or stabilization without relapse . However, 65% of the patients eventually experienced disease relapse. In our study, seven patients received azacitidine or decitabine for the treatment of relapse after HCT; however, significant response was not observed. In patients relapsing after HCT for MDS, HMA alone seems insufficient to obtain a reliable response, and an immunological approach with DLI or second HCT should be considered for long-term disease-free survival. In conclusion, the outcomes of patients relapsing after allogeneic HCT for MDS were very poor, especially in those with early relapse after HCT. However, a minority of patients who had low tumor burden benefited from an immunologic approach using DLI or second HCT. Early detection of relapse and immunotherapeutic approaches with effective cytoreductive treatment will improve the outcomes of relapsed patients. Treatment and clinical outcomes of 30 patients who relapsed after allogeneic hematopoietic cell transplantation for myelodysplastic syndrome. Abbreviations: AML, acute myeloid leukemia; BSC, best supportive care; CR, complete remission; DLI, donor lymphocyte infusion; HCT, hematopoietic cell transplantation; HMA, hypomethylating agent; LDAC, low-dose cytarabine; SD, stable disease; TRM, treatment-related mortality. Overall survival curves of the patients relapsing after allogeneic hematopoietic cell transplantation for myelodysplastic syndrome. Total patients (A). Survival curves based on the interval from transplantation to relapse (B). Abbreviations: ATG, antithymocyte globulin; BM, bone marrow; Hb, hemoglobin; HCT, hematopoietic cell transplantation; HCT-CI, HCT-comorbidity index; IPSS, International Prognosis Scoring System; PB, peripheral blood; RAEB, refractory anemia with excess blasts; RCMD, refractory cytopenia with multilineage dysplasia; R-IPSS, revised IPSS; WBC, white blood cells; WHO, World Health Organization. Abbreviations: AML, acute myeloid leukemia; BM, bone marrow; Hb, hemoglobin; HCT, hematopoietic cell transplantation; IPSS, International Prognostic Scoring System; MDS, myelodysplastic syndrome; PB, peripheral blood; R-IPSS, revised IPSS; WBC, white blood cells. Univariate analysis for overall survival. Abbreviations: AML, acute myeloid leukemia; HCT, hematopoietic cell transplantation; IPSS, International Prognostic Scoring System; MDS, myelodysplastic syndrome; RAEB, refractory anemia with excess blasts; RCMD, refractory cytopenia with multilineage dysplasia; R-IPSS, revised IPSS; WHO, World Health Organization. Abbreviations: CI, confidence interval; HCT, hematopoietic cell transplantation; HR, hazard ratio. Thanarajasingam G, Kim HT, Cutler C, et al. Outcome and prognostic factors for patients who relapse after allogeneic hematopoietic stem cell transplantation. Biol Blood Marrow Transplant 2013;19:1713-1718. Kekre N, Koreth J. Novel strategies to prevent relapse after allogeneic haematopoietic stem cell transplantation for acute myeloid leukaemia and myelodysplastic syndromes. Curr Opin Hematol 2015;22:116-122. Cheson BD, Greenberg PL, Bennett JM, et al. Clinical application and proposal for modification of the International Working Group (IWG) response criteria in myelodysplasia. Blood 2006;108:419-425. Guièze R, Damaj G, Pereira B, et al. Management of myelodysplastic syndrome relapsing after allogeneic hematopoietic stem cell transplantation: a study by the French Society of Bone Marrow Transplantation and Cell Therapies. Biol Blood Marrow Transplant 2016;22:240-247. Sauer T, Silling G, Groth C, et al. Treatment strategies in patients with AML or high-risk myelodysplastic syndrome relapsed after Allo-SCT. Bone Marrow Transplant 2015;50:485-492. Schroeder T, Czibere A, Platzbecker U, et al. Azacitidine and donor lymphocyte infusions as first salvage therapy for relapse of AML or MDS after allogeneic stem cell transplantation. Leukemia 2013;27:1229-1235. Orti G, Sanz J, Bermudez A, et al. Outcome of second allogeneic hematopoietic cell transplantation after relapse of myeloid malignancies following allogeneic hematopoietic cell transplantation: A Retrospective Cohort on Behalf of the Grupo Español de Trasplante Hematopoyetico. Biol Blood Marrow Transplant 2016;22:584-588. Takami A, Yano S, Yokoyama H, et al. Donor lymphocyte infusion for the treatment of relapsed acute myeloid leukemia after allogeneic hematopoietic stem cell transplantation: a retrospective analysis by the Adult Acute Myeloid Leukemia Working Group of the Japan Society for Hematopoietic Cell Transplantation. Biol Blood Marrow Transplant 2014;20:1785-1790. Krishnamurthy P, Potter VT, Barber LD, et al. Outcome of donor lymphocyte infusion after T cell-depleted allogeneic hematopoietic stem cell transplantation for acute myelogenous leukemia and myelodysplastic syndromes. Biol Blood Marrow Transplant 2013;19:562-568. Oran B, Giralt S, Couriel D, et al. Treatment of AML and MDS relapsing after reduced-intensity conditioning and allogeneic hematopoietic stem cell transplantation. Leukemia 2007;21:2540-2544. Platzbecker U, Wermke M, Radke J, et al. Azacitidine for treatment of imminent relapse in MDS or AML patients after allogeneic HSCT: results of the RELAZA trial. Leukemia 2012;26:381-389.